HERALD WAR REPORT: Notice from the Morpeth Herald, November 15, 1918. When the news spread throughout the Borough on Monday forenoon that the terms of the armistice had been signed by the enemy it was received on all sides with feelings of great joy and gladness. So within two days of having been elected Mayor of the Borough, Councillor Chas. Grey had the great honour of publicly announcing the fact to the townspeople. About noon the people commenced to congregate in the Market Place, and discussed with great avidity the sudden and dramatic exit of the Germans out of the war. At twelve o’clock the employees of Messrs Swinney headed by a flag-bearer, and accompanied by Councillor R.N. Swinney, and Mr Jas. Swinney, arrived in procession in front of the Town Hall. From one of the windows at the Town Hall, the Mayor addressed the large gathering down below. After much cheering the Mayor said: “I have a pleasant announcement to make. This morning at 5 o’clock the terms of the armistice was signed — (applause) — and hostilities ceased at 11 o’clock. Well, it does not mean itself has been actually signed, but you can take it that all the fighting is over (loud cheers). The large gathering then sang the National Anthem, and gave three rousing cheers. At the Town Hall, the Clock Tower, and other buildings, and from private houses, flags were flying, and in honour of the event the school children got two days holiday. During the afternoon the bells in the Clock Tower were rung right merrily. Towards the evening the main streets were thronged with happy crowds, and pleasing selections of music were rendered by the Local Volunteer Pipe Band. The children went round the town carrying all manner of flags. On Tuesday afternoon all places of business were closed. Since the official announcement of the signing of the armistice the people of Morpeth have been very jubilant. On Tuesday evening Councillor Jas. Elliott, the ex-Mayor, kindly gave a display of fireworks in the Market Place. There was a large and enthusiastic crowd, and the National Anthem and “Rule Britannia” were heartily sung. The ex-Mayor was assisted by members of the Scouts, and an effigy of the ex-Kaiser was burned. The adjourned meeting of the Morpeth Town Council was held on Tuesday evening. The Mayor (Councillor Chas. Grey) presided. At the outset the Mayor said: “Mr Ex-Mayor, Aldermen, and Councillors, I feel that before beginning our business this evening I must make reference to the Armistice, which you all know was signed yesterday at 5am, and with it, I hope, the end of the war. “But it must not be imagined that everything was settled because the war was over. People must not run away with the idea that they can at once enjoy the fruits of they peace they celebrated. One of the first problems of peace would be how to reward the men who had preserved for us everything we possessed. Another would be the future defence of the country. “That is due in the main to the valour, the sacrifice, the skill, and the resource of her sons, but it is also due to the fact that wisely, we all agreed to sink our differences, both in Parliament and outside, in the pursuit of the one common purpose which Providence had called upon the British Empire to effect. The task is not yet ended with peace. “Our great work, I mean as it effects this Council, is just beginning, and I hope we will do our little bit to lift up this country by our common efforts to a position such as it has never held in all its history. Mr Elliott, the ex-Mayor, said that he wished to associate himself with the remarks made by the Mayor. He referred to after-the-war problems and the peace terms. They rejoiced with everybody that they had overthrown the bully of Germany, and that they were now going to enjoy the fruits of this long and terrible war. Ald. Norman said they wanted to be ready for the men coming home. As a Council they must set to work right earnestly and show the people that they meant what they said. There was no houses to be had, and they, as a Council, could show their appreciation for what the brave men had done by taking up the housing scheme without delay and provide comfortable homes when the men returned. Mr Armstrong endorsed all what the speakers had said. The probability was that the ‘Boys’ would also want land when they came back, and he hoped that the Council would use their powers to secure land wherever possible. Mr Swinney remarked that they need not trouble themselves about the peace terms as there was plenty capable men set apart to do that. They had more work than they could fulfil, but he considered that this was the time for the housing scheme. The Town Clerk remarked that at Newbiggin the Local Government Board had laid it down that the houses should be built 12 to the acre. The Mayor, as chairman of the National Kitchen Sub-Committee, reported that the Sub-Committee had inspected premises offered for use as National Kitchen and recommended the old Primitive Methodist Chapel if it could be acquired on reasonable terms. That committee recommended that it be left to the Mayor to interview the Primitive Methodist authorities and make the best arrangement possible, and to report thereon, and that the Town Clerk apply to the Local Government Board for the necessary loan to establish and equip the kitchen. Mr Elliott said that he had seen the Rev. J.C. Sutcliffe, who was prepared to let them have the building at £400 purchase money or at 10/- a week rent. Mr Waterston thought there was no good going on with the scheme. It was a nasty damp place. Mr Elliott said that things had taken a turn. They had missed their chance. He suggested that the question be dropped as there would be no advantage in going on with it. Ald. Duncan stated that there would be a scarcity of food for some considerable time, but there would be an amelioration of the food supply undoubtedly. They had to remember that for the last 18 months they had to convoy the ships that brought food. Those convoys were now not necessary. Shipping would, therefore be accelerated to such an extent that food would come more freely into the country than had been the case for the past 18 months. As soon as a ship was ready it would sail with its cargo and not wait until other ships were loaded and ready. It would mean that Denmark and Norway, from which they had got supplies of butter, margarine, and eggs, would be able to deliver the goods very quickly. Ald. Hood: What about flour? Ald. Duncan: We have plenty of flour, and further supplies will be forthcoming. Mr Swinney said that he understood from the letter read by the Town Clerk at the committee meeting that the food problem was still serious. Instead of getting more ships there would be less ships, because they would be required for the shipment of men and material for a long time to come. Mr Elliott: The armistice is signed. Mr Swinney moved that the National Kitchen be proceeded with, and the premises taken at a rental of 10/- a week. Mr Armstrong, in seconding, said it would be three or four years before they got back to normal conditions. There was plenty of food in certain parts of the world, but they wanted ships to convey it over. Those ships were not to hand. The National Kitchen would be required more than ever. Mr Jackson was opposed to going on with the National Kitchen. Food would be far more plentiful than in the past. There would be more ships for the purpose of carrying food. Messrs Waterston and Simpson also opposed going on with the scheme, the latter adding that there was no need for it. Town Clerk: The Food Ministry describe the food position to be more urgently pressing than it has ever been, and likely to remain so for some years. Ald. Norman thought they should have had some idea as to how much it was going to cost to put the place in order. If they had had the initial cost they could vote more confidently. The Town Clerk said that the money for the equipment of the kitchen would be lent by the Local Government Board free of interest, and the repayment of principal would be spread over ten years. The Mayor supported the motion, and said he considered the food conditions would get worse. The motion was defeated by six votes to three. If sent to the Prime Minister it would strengthen his hands immensely. Mayor: I have sufficient confidence in the men at the head of affairs. Mr Armstrong thought the Council should pass the resolution. They had financiers with eggs in every basket, and had been a powerful influence in the past. He moved that the Council adopt the resolution. Mr Jackson seconded, and Mr Elliott supported, and the motion was carried. The Mayor said he did not know whether he had made it quite clear as to the thanksgiving service which is to be held in St James’ Church on Sunday morning first. These services had been held all over the country. The Rector and the curate had called upon him on Tuesday and said they were going to hold this service on Sunday morning. He hoped all the members of the Council would accompany him, and he hoped that the Town Clerk would mention the matter to the various public bodies. Ald. Norman thought they ought to provide for every church, and have one united thanksgiving service on neutral ground in a place where everybody could attend. He quite agreed to the Mayor going to the Established Church, but he thought that they ought to consider all the other churches, and have a thanksgiving service in a neutral place. The Mayor replied that he noticed that Mr Lloyd George, who was a strong dissenter, had gone to the Established Church. He intended during his year of office to go, personally, to every church in the town. Mr and Mrs Swinhoe, Morpeth, have received word that their son, Lance-Cpl. Jos. Swinhoe, was wounded on Oct. 20th and is now lying in Southwark Military Hospital. Mr and Mrs Robert Wright, High Church, Morpeth, have received news that their son, Driver J. Wright, A.S.C., has been gassed and is in hospital in England. Mr and Mrs James Waterston, 7 Alexandra Road, Morpeth, have received word that their son, Gunner G. Waterston, has been wounded in the right arm and is Queen Mary’s Hospital, Whalley, Lancashire. Mrs T. Wilkinson, 12 Well Way, Morpeth, has received news that her husband, Pte. Tom Wilkinson, Grenadier Guards, has been wounded in action in France. Mr and Mrs Dixon, of 3 Longhirst Colliery, Morpeth, have received word that their son, Pte Thomas Dixon, was wounded on October 19th, and is in Braintree Hospital. Pte. Ralph Payne, N.F., a brother of Mr Tom Payne, of the Avenue Theatre, Morpeth, has recently been wounded in action. LAZENBY.— Gunner J.W. Lazenby, R.F.A., eldest son of Mr and Mrs Lazenby, died October 25th, in Wimering Hospital, France, from influenza, after 3½ years active service. This is the second son and son-in-law fallen in the war, on whose sweet souls sweet Jesus have mercy. R.I.P. FOGO.— Killed in action 23rd March, Private George Fogo, Durham Light Infantry, Newbiggin-by-the-Sea. ROUTLEDGE.— Died on the 21st of October, 1918, at the Stationary Hospital, India, Gunner J. Routledge, R.F.A., eldest and dearly beloved son of Robert and Frances Routledge. Also Thomas, who died of wounds at Nippe Farm, France, on April 12th, 1918.— Ever remembered by his loving father, mother, brothers and sisters; also Florrie. DOBINSON.— Killed in action in France on the 25th October, 1918, Pte. Geo. Dobinson, aged 28, the dearly beloved husband of Ethel Dobinson, of Pegswood.— Deeply mourned by his loving wife and little sons, Lionel and Kenneth, also by his father and mother-in-law, H.S.A. Littlehales, brothers and sisters-in-law, and all who knew him. COOK.— Died of influenza at the 24th Casualty Clearing Station, Italy, on Oct. 21st, 1918, Lance-Corpl. Thomas Cook (14571), Military Foot Police, late 10th N.F., dearly beloved husband of Margaret Cook (nee Nevins), 273 Milburn Road, Seaton Hirst, Ashington.— Deeply mourned. BARNFATHER.— Killed in action on Oct. 8th, 1918, aged 24 years, Petty Officer William Barnfather, M.M. (T/Z 4281), Royal Navy Division, only and dearly beloved son of Wm. and the late Sarah Barnfather, of Ashington. Will ever be remembered by his sisters, brothers-in-law, nephews and niece.— Deeply mourned. EMBLETON.— Killed in action on Nov. 14th, 1916, aged 20 years, Pte. John Thomas Embleton, the second and dearly beloved son of Thomas and Lydia Embleton, No. 5, Fourth Row, Ashington.— Ever remembered by his loving father and mother, and sister, and his brother Joe (in the Army), and all who knew him. HENDERSON.— Died from wounds at the 64th Casualty Clearing Station, France, on Oct. 26th, Pte. William Henderson (17231), D.L.I., dearly beloved son of Charles and Dorothy Elizabeth Henderson, Barrington Colliery. Beloved by all who knew him. For Joseph Charles Lumsden, Second Lieut., Northumberland Fusiliers, of Plessey Hall, will be held in Stannington Parish Church on Sunday evening, Nov. 17th, at 6 o’clock. All friends are invited. Interesting speeches were made at the annual meeting of the Morpeth Town Council, held in the Council Chamber last Saturday, when the new Mayor for the ensuing year was elected. Considerable interest was centred in the event, and in addition to the members and officials of the Council present, there was a good attendance of the general public. Councillor Sanderson said it was with the greatest possible pleasure that he proposed that Councillor Chas. Grey be elected Mayor of the of the Borough for the ensuing year. Coun. Jas. Elliott, the ex-Mayor said their cattle market would have the weight and influence of Messrs Maughan, the cattle salesmen, added to it in the future when the present control was lifted off. Whilst food control and Parliamentary Registration had been added to their expenditure, and their expenditure, and their workmen’s wages had been increased 20/- a week above pre-war rates, and all their municipal expenditure had been immensely increased, yet they had managed to keep their general district rate at the same figure as at the beginning of the war. He thought that the system of monthly examination of books and accounts, introduced by him, and recently adopted by the Council would lead to more confidence and satisfaction regarding their finance both in the Council and outside. Speaking of finance reminded him of the splendid response Morpeth had made in the War Weapons Week. Their quota of £20,000 was exceeded by £48,000, the grand total being £68,000, a figure they could all be proud of. He trusted that his Worship the Mayor would have a similar success with his Feed the Guns Week in December. During the last twelve months, the Mayoress, with assistance, had raised over £1,000 for charitable purposes, nearly £500 of which had been got by flag days. He had had the pleasure of presenting suitable gifts to 16 of their gallant Morpeth men from the local War Heroes Fund. That brought him to the subject that they had been discussing and waiting for, and that was the declaration of Peace. Well, it would fall to his successor that honour, but he was sure that they were all elated that it was so near, and would, they trusted, be a perfectly satisfactory character. The proposed field day which was to be held on Sunday first by the Morpeth Company of the 4th Volunteer Battalion Northumberland Fusiliers at Longhirst Moor has been postponed. The men will parade at the Drill Hall at 10am, and accompany the Mayor (Councillor C. Grey) and Corporation to St James’ Church, where a thanksgiving service is to be held. It is hoped that every man will make an effort to attend, for it has been arranged that a photograph be taken of the Company. The Mayor and Corporation will attend a special service of thanksgiving for deliverance from international strife, to be held in St James’ Church, Morpeth, on Sunday first at 10.45am. All public bodies in the borough and the public generally are requested to assemble in the Market Place at 10.15am, and to join in the procession to the church. Adopters and others who have been subscribers towards the cost of parcels to individual prisoners of war are herby informed that such subscriptions will no longer be necessary, as arrangements have been made by the Central Committee for feeding our prisoners until the time of their repatriation. 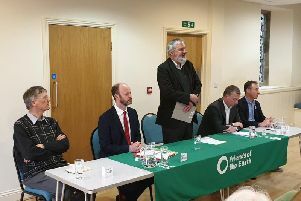 Mr F.G. Thornborough, the Liberal candidate for the Parliamentary Borough of Morpeth, addressed a meeting in the Town Hall, Morpeth, last Monday evening. Mr R. C. Oliver, who presided, was supported by Ald. Ed. Norman and Mr Jas. Jobling. The Chairman said they were met on the evening of one of the great days in history, a day that would be remembered when their names and personality would long be forgotten, a day that would be remembered through the ages as long as they continued to take any interest whatever for human life and action. After four years and three months of unparalleled effort, of suffering, of privation, and unspeakable losses, they has never wavered in their belief that they were fighting for justice, for righteousness, and for liberty. Through days of anxiety, when doubt and fear had almost caused their hearts to sink within them, they had grievous disappointments, but they had never doubted that the clouds would break, and they had the glad satisfaction of knowing that right had triumphed. The despot, who in his arrogance began this war, and who, lately, had been endeavouring to change his suit of shining armour into one of the democratic black coat, had been hurled from his throne. They believed that was one of the important factors in clearing the path for a clean peace — a peace that would never again be broken by the arbitrary decision of any ruler. The joy bells were ringing in their old Clock Tower, and they had rung from many steeples and towers throughout the length and breadth of the land. They were ringing in their hearts, but in the pauses they heard the solemn knell that reminded them of sadness here and there. There were hours in which the joy of today could not enter unqualified. They had all the promising young lives they had known been nobly laid down for their country and humanity’s sake. They could never pay the debt that they owed to them. They reverently saluted their memories that night, and it lay with them to see that the fruits of this crowning victory were not wasted or thrown away. It was very important that they should see that they had in Parliament wise statesmen, who had a thorough grasp of the great issues that were at stake. The task before them was a tremendous one, that would require all the energy and all the knowledge they could command; and that night they met for the first time, after some years, at a political party meeting, with the view of hearing one man who was prepared to take up that burden with all the knowledge and all the love that he possessed. He went on to say that he was extremely glad that women were to have the vote in the forthcoming election. He considered that an election should not be immediate unless full opportunity was given to the soldiers to vote. So far as he was concerned he thought it was essential that they should preserve for some time, as far as they could, that unity of spirit and of soul that had characterised this country for the greater part of those terrible years. It did not follow from that that they should look at things from the same point of view; but it did mean that they could see that none of them would raise domestic issues unnecessarily, and so far as he was concerned he should want to give his support to a Government that was trying to make the best possible arrangements for an intermediate period, and did not introduce reactionary legislation. As far as he was concerned there would be no factious opposition. They wanted to see the spirit of co-operation in this country, and they wanted to see it particularly in industry. If they were going to have, after the war, employees on the one hand and employees on the other looking at each other as rivals, one trying to get the better of the other, then they should have in this country terrible times to pass through. He believed the war had taught them something. He believed that they should have learned, and ought to have learned, something of the spirit of comradeship. He hoped they should be able to work together and, so far as that spirit in industry was concerned, there should be one ideal in life. It seemed to him that the real basis of life for the individual was service. On the motion of Ald Norman, seconded by Mr Jas. Jobling, a hearty vote of thanks was accorded Mr Thornborough for his able and bold address. On Tuesday evening, Mr Thornborough addressed a largely attended meeting in the Linton and Woodhorn Miners’ Hall. Ald. John Craigs presided. After his able address the speaker was accorded a hearty vote of thanks. A benefit concert was given in the Institute Hall, Pegswood, on Thursday night last, by Mr J.W.F. Heslop’s concert party of Ashington, the proceeds being in aid of Pte. Robt. Brewis, who had the misfortune to lose a leg whilst on active service. The hall was well filled by an appreciative audience, and the artistes being in tip-top form, they did full justice to an excellent programme. County Councillor G.R. Nichol presided, and while remarking on the purpose of the concert, also announced a benefit concert in aid of ex-Sergt. John Smith, M.M., which is to be given on Saturday, Nov. 2nd, in the above hall. Votes of thanks to the artistes and chairman concluded an enjoyable concert. A general meeting of the members of the above Society was held in the Soldiers’ Institute, Morpeth, last Monday afternoon, Mrs Joseph Miller presiding over a good attendance. In opening the meeting Mrs Miller said that they had met under very happy auspices. She referred to the good news received that day, and asked them in their exultations not to forget those who had lost dear ones in the war, and not to be selfish in their happiness, but to extend all the love and sympathy they possibly could. They ought to be very grateful and thank God for their deliverance. They had seen what the selfishness of Germany had done for their nation. The Kaiser’s reign had been marked by tyranny and oppression, and it had had an inglorious ending. They had sacrificed all morality and righteousness for material power, and now they had been humbled, and such a condition of things must ever result in the same way.